Aberdeen publican golfer of the month. Glentanar Bar, Holburn Street, Aberdeen. Royal Oak, Marischal Street. Aberdeen. Mr Michael Hay, president of the Aberdeenshire, Banffshire and Kincardine Licensed Trade Association. 1979. The notable link between the Hay family and the Aberdeenshire, Banffshire and Kincardine L.T.A. was further strengthened at the association's A.G.M. 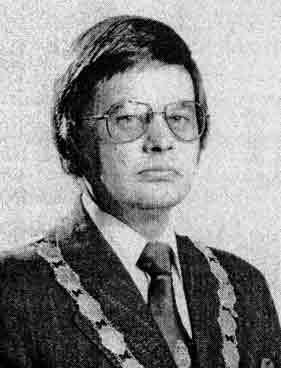 when Mr. Michael Hay, Inverurie, was appointed president. He had been acting-president for some time following the death of Mr. Taylor Third. He now followed in the tradition of his grandfather, the late Mr. A. Johnston Hay, and a great-great-uncle, Mr. William Hay, Alford, who was president from 1900 until 1922. Mr. Michael Hay is marketing director for the family business of William Hay & Sons (Aberdeen). 1979. A party of Members from the Aberdeen L.T.A. are pictured on a visit to the whisky and blending plant of John Dewar distillery at Perth. They include (seventh from the left standing) Mr. Eddie Watson, president, and Mr. Bill Smith, Dutch Mill (third left, standing.) 1979. Another image of Aberdeen licensees' 1979.